Square Enix pushed another addition of the Final Fantasy series to Google Play today, this time being Final Fantasy VI. FFVI first debuted back in 1994 and has been completely recreated for mobile devices. If you have purchased any of the other Square Enix’s titles, then you will know what you are in store for. A true Final Fantasy experience worthy of your hard-earned cash. Players have the ability to control and develop characters any way they would like, thanks to the magicite system for controlling spells and summoning. And for the true fans among us, FFVI was the first title in the series to feature the Ultima weapon, the most powerful sword of all, which appeared in many FF titles that followed this one. Again, if you like Final Fantasy, you can’t go wrong. All graphics have been painstakingly recreated, bringing the world of FINAL FANTASY VI to your mobile device for the very first time! Kazuko Shibuya, one of the graphics designers involved in the FINAL FANTASY series from the very start, personally worked on the main characters and supervised the recreation of the game’s graphics. Square Enix’s vast experience in A-list smartphone RPG titles has been harnessed in implementing intuitive user-friendly controls that make the game easy to play on touch screens. The battle interface has received particular attention, with a complete overhaul for use on your smartphone. 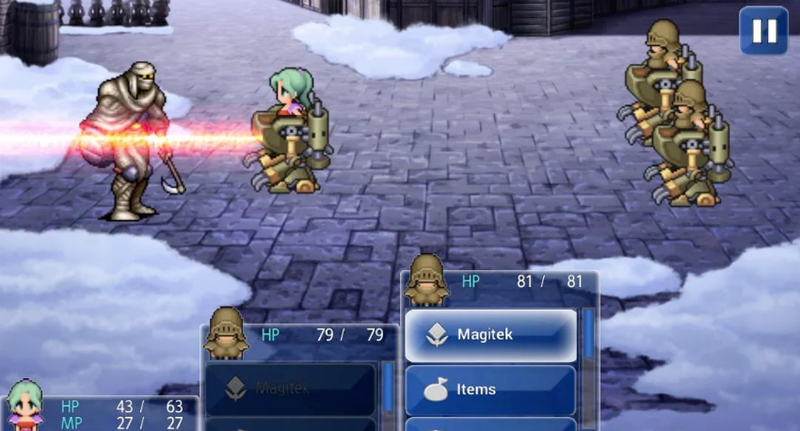 This smartphone release includes the new magicites and events that were introduced in the 2006 remake. Some events have been optimized to be played with user-friendly touch controls. The game is now live, so go grab it.